Firstly, I must thank you for tasking the time to look at my project with me. Although I have some understanding of electrics and electronics I am not very knowledgeable . I am an engineer by trade and have a good head for visualization and comprehension; I am also skilled at machine works and soldering. 1. The bottom one; this will house the battery. It is vented via the brass louvered grill. 2. The middle compartment; this will house all the electrical , including those which face out (panel mount) through the outer cover , being the Isolator switch, charging socket, amp meter and volt meter. 3. The top compartment which has the hinge is for storage of daily bits and bobs. The concept: - In our Steampunk world, my wife is a time jumper and I , a demon catcher . I wear the backpack which has a special gun which fires a charged beam of particles (not for real) this interrupt the jumper and demons ability to teleport . Once captured the demon or jumper is held in stasis. This is where the LED lights come in, representing the particle beam. The LED controller has an infrared pickup, which controls the motion, color and speed of the lights. The feed to the lights splits into two as it leaves the controller. One section of lights goes down to my gun and the second section of lights goes down to my belt where it forms a lasso. This section has a hook on the end which can be clipped to a collar my wife wears. This forms the “ Keeper ” in our story, preventing her from Jumping at will. The battery will be recharged when the backpack is off , the charger is a self - contained (wall wart) type which came with the battery 12V 6 amps, so the charging socket is only an interface between the outside and inside the battery compartment. No charging circuit is required. A circuit board which will provide me with a stabilized voltage regulation of 12V 3 A via a 5 A switching rectifier? to reduce heat generation, and incorporating some form of circuit protection – Which I will need your expertise to determine . To use the Isolation switch to isolate the battery from the rest of the system during charging. The input supply is acquired from a ready made 14V/5amp SMPS unit, which can be seen at the extreme left side of the image. However procuring it ready made would be much easier and hassle free, and is recommended here. As requested, the output from the SMPS can be seen passing through a changeover switch stage for enabling the option of a direct input to the load or through an ammeter depending upon the position of the SPST switch. 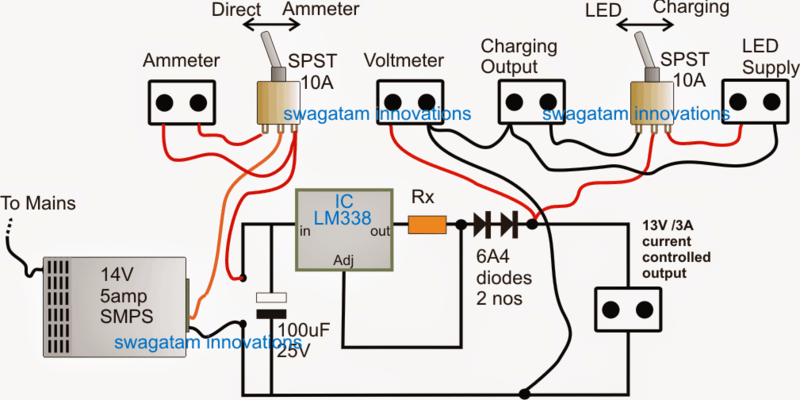 Next, the input supply is allowed to traverse through an LM338 IC stage configured as a current controller in order to manage the correct amount of amps to the load (LED modules), as well as for the charging of the battery. As indicated in the request, the current controlled 14V supply is terminated into a couple of pluggable sockets, one for enabling voltage measurement externally, while the remaining two facilitate the powering of the LEDs and the charging of the battery via another SPST switch. The regulated 12V output from this 12v LED backpack power supply circuit can be seen connected with an extra separate socket so that the user is able to access the voltage for powering any other desired 12V gadget through the same. Many thanks for your assistance, I took a look at your design but noted a number of things which I would like to put forward for your confirmation, please. - I note a permanent charger SMPT....IN my design this would need to be the battery - I note a switch on Ampmeter, but I would need to have mine permanently connected. - You have labelled the Charging Socket as "Output" but I require it to be an "Input". My charger plugs directly into the wall and charging will be through this socket. I have redrawn (in basic form) what you provided me but with my alterations, would you be kind enough to check the design through and make sure it is OK. 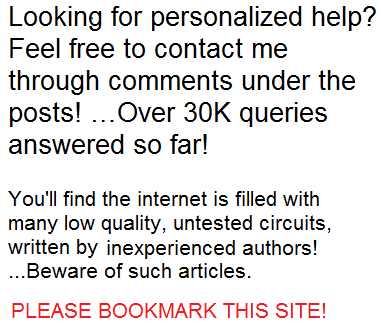 Thanks for pointing out the mistakes, however we have another associated problem here, it is the LM338 current controller circuit which needs to be used both ways, that is while charging the battery and also while illuminating the LED, therefore the wiring needs to be done rather in the manner shown in the attachment, please check it and let me know if you any doubts. Hopefully this will solve all the indicated issues. In the corrected diagram shown above, a single TPDT switch is employed and is able to achieve the intended charging of the battery as well as the illumination of the LED through a common LM338 current controller circuit. So this idea enables both the charging of the battery and the illuminating of the LED to be implemented via a safely calculated current controlled supply, making the unit much compact and cost effective. Rest of the section of the diagram are self evident. Just to say thank you for all your help with this project, I have just ordered all the bits I need to complete. so i wish to assemble a circuit, it can control or reduce the ampere according to the light. 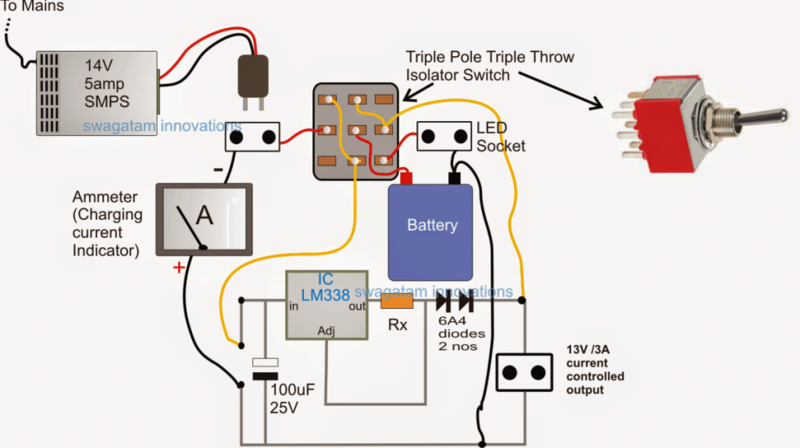 if i switch on one light or all, circuit has to give limited voltage/ampere to each light. or each light strip i want to add a small circuit like this. i think you may know what kind of circuit aim looking for. if you know any such circuit kindly give me a reply. Hi Mohamed, if the voltage is maintained at the specified 12V then current can never have any effect. Whether is 12V/100Ah or 12V/4.5Ah both should have the same heating effect. Your strip may be getting warm because the 100Ah is able to sustain the required full 1amp without dropping 12V, whereas your smaller battery could be dropping voltage in an effort to compensate 1 amp, and that’s why the LED may not be getting warm due to reduction in overall power. However the LED strip already has limiting resistors and is not supposed to get hot at the specified 12V, at any circumstances?